It might have been a popular trick to throw a red sock into someone’s white undies while in college, but in the years since, pink undies, or any other types of clothing for that matter, is no laughing matter. In fact, pulling your laundry out of the washing machine and having it be any color other than that you put in can be very frustrating, not to mention expensive. Fortunately, there are several thoughts to keep in mind to keep your laundry from coming out pink unless, of course, it went in pink. Check Them Out. Before you put anything in the wash, especially new items, check them to see whether you think the colors will bleed. If you have a doubt, wash them separately, at least for the first few times you wash them. If you are still wondering, make sure to read the labels and wash accordingly. Separate. Separating your laundry, whites, lights and pastels, bright colors, darks, and towels, is always a good idea. Too much work? Separate them as you throw them into hampers after you have worn them. Minimize Friction. As you wash items over time, fibers tend to break down. This releases dyes and leads to fading. You can minimize this effect by washing like items such as heavy fabrics (jeans and the like) together. Better yet, turn them inside out and wish zippers closed. Using the permanent press cycle on your washing machine is also a good move. Test For Colorfastness. If you are unsure of the colorfastness of certain items, test them by putting them in a sink full of soapy water for a half-hour. If after that time the water has changed colors, the items will bleed and are in need of special handling. Don’t Use Salt or Vinegar. There is a common misconception that adding salt or vinegar to your wash will improve colorfastness (thanks, Pinterest), but this is incorrect. A very small group of fabrics set in vinegar, but this is very uncommon. Vinegar does help to eliminate odors but use it sparingly. Wash In Cold Water. 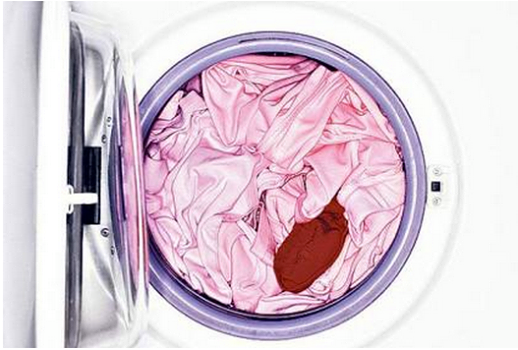 One of the best ways to help prevent your wash from turning pink is to wash everything in cold water. Negative side effects such as a laundry that is less clean will be minimized, and you can usually counter this with a good detergent. Use Color Catching Sheets. Buy these anywhere they sell detergents, and they will help to prevent bleeding. Hand Wash. If all else fails, and you are very concerned about colorfastness, hand wash the items of concern. You will have cut the chances of damaging other clothes and left pink laundry to the fraternity guys. If you are still concerned about college pranks or otherwise worried about pink laundry, why not get your picked up, washed and delivered by the Laundry Center? Laundry pick up and delivery is free, and you won’t have to worry about anything coming back pink. This entry was posted	on Wednesday, March 2nd, 2016 at 1:46 pm	and is filed under Laundry Service. You can follow any responses to this entry through the RSS 2.0 feed. You can leave a response, or trackback from your own site.